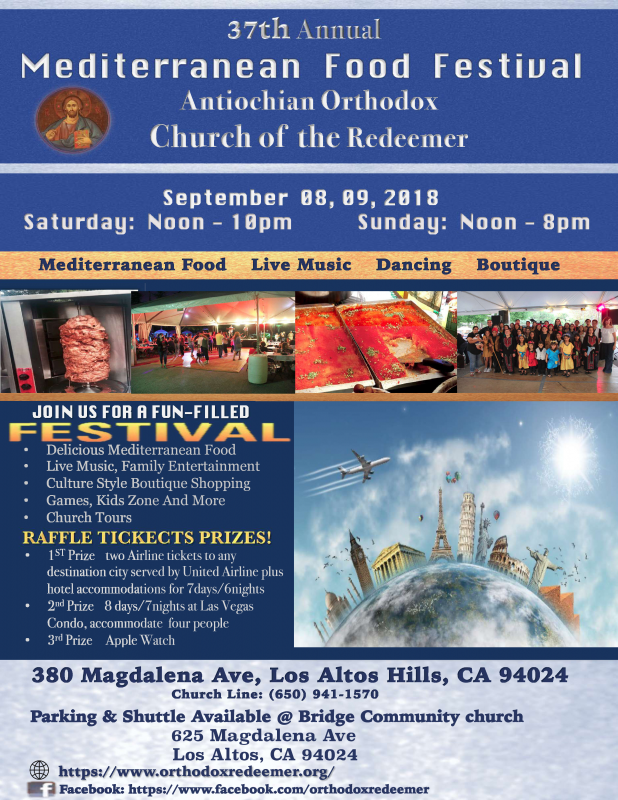 In early September of every year, The Antiochian Orthodox Church of the Redeemer organizes a Mediterranean Food Festival. This is a special event that allows the church to welcome visitors, show them some of the Mediterranean country tranditions and have them experience the culture of the people that sustained the existence of Orthodox Christianity in the east since the creation of the Ancient Church. You will find these traditions in the variety of food items, such as Shawarma, Kibbe, Tabouli, and desserts, the music and live singers, and traditional dances by the youth groups. There is also an Orthodox Divine Liturgy that you can attend on Sunday morning before the Festival begins for the rest of the day. The festival is completely prepared for and run by volunteers from the parish itself. The benefits of the festival support The Church of the Redeemer in its mission to serve the local community and proclaim the message of our Lord Jesus Christ. The festival occurs on Saturday and Sunday. Its a fun event for the whole family. People usually plan to be there for a big part of the day. And many of them come again on Sunday after they have enjoyed their time on Saturday. If interested to learn more about the Orthodox Church of Antioch and the Church of the Redeemer in particular, you can always find Father Samer there and accompany him on a church tour. Church tour timings are announced prior to the event and are a great opportunity to learn about the Orthodox Christian Faith and ask questions to a Priest. You can hang out with the parishioners if you like or plan to meet your relatives and friends in a Mediterranean atmosphere. There is an area dedicated to the kids so they are sure to enjoy their time as well. If you stay late in the evening on Saturday you can see the highlight of the day with live entertainment. And if you come in the morning on Sunday you can attend the church service (Divine Liturgy) before having lunch and enjoying the rest of your day at the festival.